The 2016 Motorsport Merchandise Superbike Classic TT Race is set to be one of the most eagerly awaited at this year’s Classic TT Races presented by Bennetts with some of road racing’s finest riders confirmed for the four lap race on Monday 29th August. 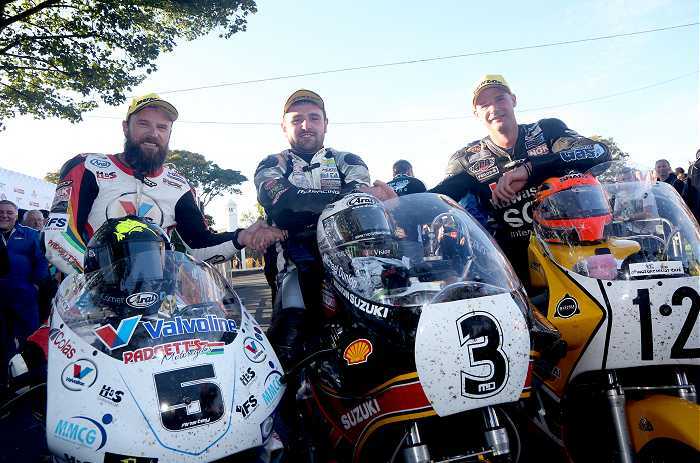 Almost 80 entries have been accepted for the race and with reigning champion Michael Dunlop back on the entry list on Steve Wheatman’s Team Classic Suzuki, he’s again expected to go head-to-head with 2014 winner Bruce Anstey. Both Dunlop and Anstey have lapped in excess of 125mph and while Dunlop leads the win count, two victories to one, Anstey set a new lap record of 126.261mph on the Valvoline Racing by Padgetts Motorcycles YZR500 Yamaha twelve months ago. With 13 riders having lapped at more than 120mph last year, one of the strongest threats to the pair will come from the three-pronged attack from Mistral Racing who will be fielding Steve Mercer, Dan Kneen and Jamie Coward on 750cc ZXR Kawasaki’s. All three have a great chance of standing on the rostrum, at least, with Coward having taken sixth place last year. Kneen took ninth in 2015, on the Valvoline Racing OW01 Yamaha, while Mercer was on course for a podium in 2013 before slipping off at low speed at Ramsey Hairpin although he came back to take fourth the following year. All three have enjoyed excellent 2016 seasons while Kneen will be particularly keen to impress after injury forced him out of this year’s TT. Two more potential race winners in Dean Harrison and James Hillier lining up on 750cc ZXR Kawasaki’s with Dean Harrison more likely to have the potential to challenge Dunlop and Anstey on his Silicone Engineering-entered machine. He took three podiums at this year’s TT, as did Hillier who’s back with Greenall Racing for the Classic TT having finished fourth in the corresponding race last year. Ivan Lintin, winner of the Bennetts Lightweight TT for the second year in a row this year, will be on board the Devitt RC Express Racing entered Kawasaki with Horst Saiger (Greenall Racing), Dan Stewart (MBR/Wilcock Consulting) and John Barton (Excel Group IOM/Wemoto) also using the 750cc ZXR Kawasaki as their machine of choice. Lee Johnston (Team Classic Suzuki) hasn’t yet ruled out competing at the Classic TT despite suffering a broken collarbone at the recent Ulster Grand Prix while Michael Rutter is also expected to feature on the leaderboard. The Bridgnorth rider rides Roger Winfield’s Harris Yamaha this year, the same bike that Ryan Farquhar took to third place last year. 2016 TT Privateer’s Champion Dan Hegarty (peoplesbike.com Suzuki) makes his debut at the Classic TT with the 2015 Champion Dan Cooper another to ride an XR69 Suzuki, this time for Steve Caffyn’s CSC Racing. Michael Russell (Bragg Creek Motorsport), Kiaran Hankin (KHHire), Adrian Harrison (Bob Jackson Racing) and David Madsen-Mygdal (RJP Racing) lead the Honda charge on the iconic RC30 Honda while veteran Nick Jefferies joins Dunlop and Johnston at Team Classic Suzuki. Olie Linsdell is back for another go on the Flitwick Motorcycles 750cc Yamaha with Ben Wylie also returning on a 750cc Bimota. David Sellers, so impressive on his TT debut this year, has the DSR Racing 750cc Kawasaki at his disposal with David Hewson (Obsession Engineering/Stafford Evans 888 Ducati), Ryan Kneen (CBG Contractors Kawasaki), Rob Hodson (PRF Racing 750cc Suzuki), Timothee Monot (TMR Performances Moto 750cc Yamaha) and Paul Owen (Team #98 750cc Yamaha) a selection of the other riders on an impressive entry list.